Posted October 21, 2015 by Shopping ForHealth & filed under News. 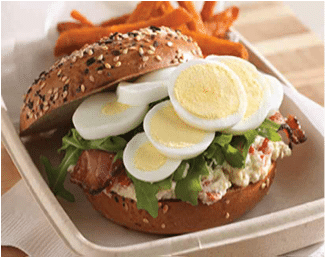 From the American Egg Board, here are three easy ways to enjoy outdoor fall fun – eggs in a sandwich, to go! Note that when including eggs in a tailgate, hike or picnic, they should always be packed in a cooler on ice. Do not allow cooked eggs to remain at room temperature for longer than one hour, including preparation and service time. In a large sauté pan, cook turkey sausage until fully cooked, breaking into small pieces as it cooks. Set aside and keep warm. For each sandwich, cook three egg whites or 3 ½ ounces liquid egg whites in a spray-coated 8-inch nonstick sauté pan. Add in turkey sausage crumbles. Cook egg whites until firm and opaque throughout, with no visible liquid egg remaining. 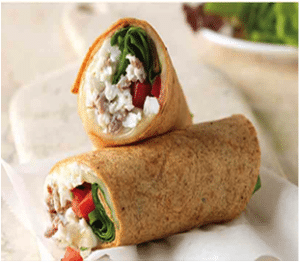 To assemble wraps, cover center with scrambled egg whites, 2 ounces (⅓ cup) and turkey sausage crumbles, 2 tablespoons prepared tomato bruschetta, one slice provolone and 3/4-ounce (½ cup) chopped spinach leaves. Grill or fry wrap over medium heat just until cheese melts and heated throughout. Combine cheddar, mayonnaise, Worcestershire sauce, garlic, shallots and pepper in a mixer and whip until well combined and fairly smooth (about 2 minutes). Slowly stir in the Gorgonzola and roasted red peppers and mix just until combined. The cheese spread will be chunky. Chill. Preheat oven to 350° F. Place strips of peppered bacon on parchment-lined baking sheet. Bake until bacon is crisp and browned, about 15 – 18 minutes. Cut in half and keep warm. Toast bagel. To assemble, cover bottom half of bagel with 3 tablespoons blue pimento cheese, then top with 2 half slices of bacon, ¼ cup baby arugula and a sliced, hard-cooked egg. Cover with toasted bagel top. Grill peppers, onions and garlic in olive oil until soft and lightly browned. Sprinkle on basil. Add salt and pepper to taste. Toss; keep warm. Grill steak slices on hot grill until thoroughly cooked, about 2 to 3 minutes; keep warm. Blend eggs, salt and lemon-pepper. Cook and scramble eggs in small batches, as needed, until firm throughout with no visible liquid egg remaining. Keep eggs warm. For each sandwich, layer 2 slices cheese, 1.5 oz. onion mixture, 2.5 oz. cooked meat slices, and 1/2 cup scrambled eggs on half of one side of tortilla. 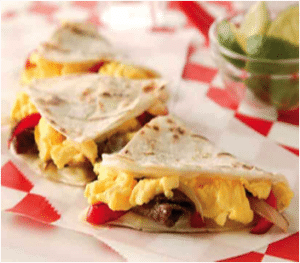 Fold tortilla over; grill or cook on Panini press until cheese is melted. Cut in half to serve. Posted October 14, 2015 by Shopping ForHealth & filed under News, Protein. Research suggests that balancing protein intake evenly throughout the day – rather than eating protein primarily at dinner, like many people do — may be a key to a healthier diet. So how can you help your shoppers better balance protein intake? Bump up protein at breakfast. A breakfast of buttered white toast and juice may be fast, but only offers about 2 grams of protein. Pair it with a serving of chicken sausage patties (10 grams protein) or turkey sausage links (12 grams), or a couple of scrambled eggs (12 grams). Or, swap it for a turkey sausage, egg and cheese breakfast sandwich (15 grams). Enjoy with fresh fruit. Pack protein at lunch. Sandwiches made with lean turkey, chicken or ham fit the bill. Pair with a cup of low-fat yogurt or milk for additional protein. Enjoy a satisfying protein snack. A few ideas: a slice of lean ham wrapped around a cheese stick, a hard-cooked egg, or peanut butter on whole-grain crackers. Fine-tune your protein portion at dinner. Once you boost protein intake earlier in the day, you can be more mindful about your dinner portion. A serving of lean meat is about the size of a deck of cards and supplies about 25 grams of protein. Surround it with lots of vegetables and a whole-grain side like brown rice, quinoa or a whole-wheat roll. And perhaps most important, know where the protein is, and which foods contain it. General rule of thumb: foods from animal sources such as poultry, meat, seafood, milk and eggs are top choices for protein. Be aware of the times during the day that you make these food choices! 1Mamerow MM, Mettler JA, English KL, et al. Dietary protein distribution positively influences 24-h muscle protein synthesis in healthy adults. J Nutr. 2014;144:876-880. 2Belza A, Ritz C, Sørensen MQ, et al. Contribution of gastroenteropancreatic appetite hormones to protein-induced satiety. Am J Clin Nutr. 2013;97:980-989. Posted October 7, 2015 by Shopping ForHealth & filed under News. “Snacks” sometimes have a negative image, as the source of unnecessary or poor quality calories. But it doesn’t have to be that way. Some people prefer to eat in a small-meal, snacking format throughout the day, rather than the more traditional pattern of three meals a day. And when eating in this way, it’s extremely important to think about the quality of the food eaten – making sure the snack is balanced with fiber, protein and/or healthy fats. Cottage cheese and berries. With 13 grams of protein per ½ cup, Daisy Cottage Cheese delivers the goods. Topping cottage cheese with the berries is an excellent combination of nutrients and fiber to fuel your customers throughout the day. 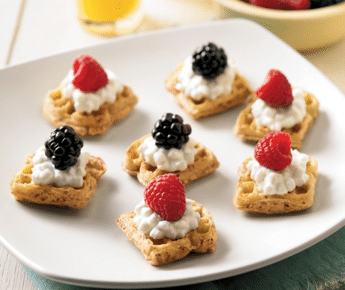 To add a different flavor and texture, spread the mixture on top of whole wheat crackers. Hummus and Veggies. This is a favorite combination. The fiber, fat and protein in the hummus complements any veggie perfectly. To make it super simple, point your shoppers to bags of baby carrots so there’s no peeling, cutting or slicing. Hardboiled eggs and an orange. Whole eggs offer around six grams of protein per egg while the orange offers a few grams of fiber, in addition to a variety of vitamins and minerals. Together they’re very satiating and help “bridge the gap” to give a little dose of energy between meals. Nut butter and apple. This pair is like cookies and milk; nut butter is a perfect partner to the apple. The duo makes an ideal combination of protein, fat, and fiber. For those with nut allergies, sunflower seed butter works just as well. Trail mix. For the ultimate in on-the-go snacks, try homemade trail mix. Premade mixes are available, or you can encourage your shoppers to get a little creative and have better control of their nutritional intake by mixing up their own favorite combinations of nuts along with a little dried fruit. A 2:1 ratio of nuts to dried fruit works well. Remind your customers that the key with snacking is that the snacks are purposeful, instead of mindless, and that they include the satiating combination of protein, fiber and healthy fats. Posted September 29, 2015 by Shopping ForHealth & filed under Healthy, Nuts. With more than 150 health studies on head-to-toe health conducted around the globe, the evidence supports walnuts as a leading nut for nutrition. All of this adds up to a nut that has a positive contribution fighting multiple health conditions, including heart disease, obesity, diabetes, infertility, cancer and cognitive health. With fiber and healthy fats, walnuts provide satiety to help with weight management. Convinced you need more walnuts in your diet? 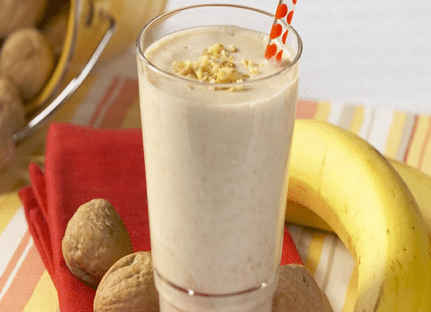 This Banana Walnut Shake from the California Walnut Commission is a tasty, easy way to add them. And check the Healthy Morsel Blog in the coming weeks for information on walnuts and nutrition attributes affecting other serious health conditions. Place banana, yogurt, walnuts, and 1 tablespoon honey in a blender. Blend on low speed until ingredients start to mix together. Then increase to high speed and blend until smooth. For a sweeter shake, add another tablespoon of honey. Serve immediately. Tip: To make a frozen banana, peel & cut into chunks. Wrap in plastic & place in freezer 2-3 hours/overnight. The Fall 2015 Shopping for Health Newsletter Comes Out This Week! Posted September 23, 2015 by Shopping ForHealth & filed under News. Supermarket RDs, check your in-box this week for the Fall 2015 Shopping for Health Newsletter. You will find promotion ideas, nutrition updates, recipes and photographs, and other shopper outreach tools for your in-store use. This edition of the quarterly SFH newsletter includes sections of information from Daisy Cottage Cheese, the Tri-Lamb Group, Tyson Foods and Vestcom. Shopping for Health would love to have your feedback on the materials provided, or know how you might use the information. Please comment here or send a note to nancy@shoppingforhealth.org. Posted September 16, 2015 by Shopping ForHealth & filed under 2015 Shopping for Health Conference, Main Dish, Protein. Your shoppers may think of lamb as a special occasion food, but with a few cooking tips and a little inspiration, they will see that it’s an excellent choice year-round, even for weeknight family eating. Lamb is a delicious and nutrient-rich food, making it a natural fit for healthy diet. On average, a 3-ounce serving of lamb has only 175 calories and meets the FDA definition for lean. The leanest cuts of lamb are those from the leg, loin and shank. Lamb is also an excellent source of protein, vitamin B12, niacin, zinc and selenium and a good source of iron and riboflavin. 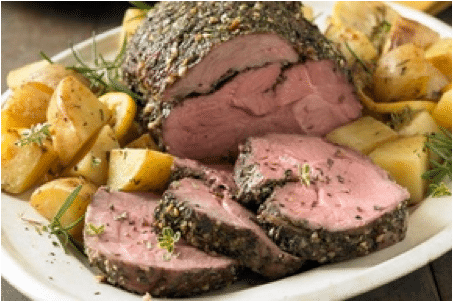 A three pound leg of lamb will yield eight portions, which is perfect for two dinners for a family of four. And the best way to enjoy it may be to encourage your shoppers to cook once and eat twice. Here are two recipes from the Tri-Lamb Group that transform one great dinner into something equally as good tomorrow — but with less preparation time. Serve this easy to prepare Lamb Roast with Garden Vegetables as a Sunday night dinner, for example, and reserve half the meat to make Lamb Pitas a night or two later. Everyone will appreciate the ease of planning, especially during this busy back-to-school time of year. Preheat oven to 350°F. Stir together herbs and garlic in a small bowl; set aside 2 tablespoons. Remove ties or netting from lamb. Using a small sharp knife, make slits deep into the lamb spacing 1/2-inch apart. Rub the larger amount of herb mixture over the surface and into the center of the lamb, pressing mixture into the slits. Tie in 2 places with kitchen string to secure. Place potatoes, onions, oil, lemons and reserved herb mixture in a large roasting pan with shallow sides and toss well to coat. Nestle lamb into the center and season with salt and pepper. Cook for about 1 1/2 hours or until lamb is cooked to your liking (145°F for medium rare, 160°F for medium), stirring vegetables every 1/2 hour. Stir together all tzatziki ingredients in a small bowl; set aside. Cut each pita round in half. Open carefully and fill with lettuce, lamb, tomato and onion. Serve with Mint Tzatkiki. Posted September 9, 2015 by Shopping ForHealth & filed under News. One of the highlights of Shopping for Health 2015 in Napa was a fabulous dinner in the caves of Clos Pegase Winery, sponsored by Tyson Foods and prepared by their chef, Ashley Zulpo. The supermarket dietitian guests in attendance saw first-hand how everyday Tyson convenience products like packaged Grilled & Ready Diced Chicken, Jimmy Dean Cooked Sausage and Hillshire Farm Lunch Meat can be transformed into an elegant meal. • Combine avocados, tahini, lemon juice and oil in a mixing bowl; season with salt and pepper, refrigerate. • Combine vinegar, sugar and water in a small sauce pot. Bring mixture to a boil, make sure sugar is dissolved. Pour hot liquid over the cucumbers and cool in an ice bath. 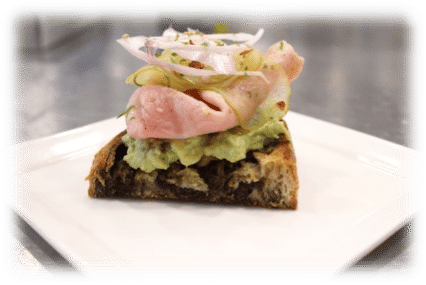 To build the toasts: spread avocado mash on rye toast, 2-3 ribbons of pickled cucumbers, 1 slice of ham, shallots and garnishes. Blend all ingredients for the red pepper sauce minus the olive oil and yogurt, in a food processor or blender. While the blender is going, pour in the oil slowly until the color starts to change. Remove from the blender and combine with the yogurt, refrigerate. Toss onion, parsley and arugula with olive oil, salt and pepper. 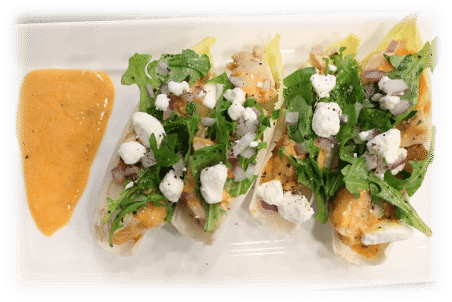 To build the tacos: layer 3-4 pieces of chicken into the endive leaf, drizzle with sauce and top with salad and cheese. Sweat onions, garlic and celery in a stock pot until aromatic. 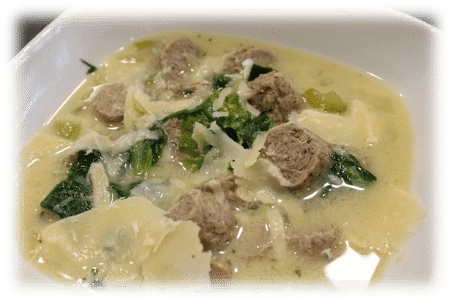 Stir in the chicken stock and bring to a boil, reduce heat and let simmer for 15 minutes, add sausage, escarole, spinach and herbs. Whisk in a small amount of the hot soup into a bowl with the egg. Add egg back to the soup and whisk until the egg looks creamy and not scrambled. Season with salt and pepper. Plant-based diets emphasize eating minimally processed foods that come mostly from plants, along with modest amounts of fish, lean meat and low-fat dairy, and red meat only sparingly. It’s easy to see that a plant-based diet is good for the heart, weight control and maintaining overall health, as well as for the environment. We talked a lot about the benefits of plant-based eating at the 2015 Shopping for Health Conference, with a fascinating presentation by Wendy Bazilian, DrPh, MA, RD, on behalf of the California Walnut Commission. The good news is that you can focus on adding to the diet, rather than subtracting. “Plant-based diet” means eating more plant-based foods, and usually does not require a complete diet overhaul. Start meals with a soup or salad. Feature a fruit bowl or fruit plate. Don’t confuse this term with Plant-based eating is inclusive and allows for meats. Make a vegetable crudité to nibble on while preparing dinner. Broaden your cooking with beans. Eat nuts like walnuts every day, as a snack. Explore new herbs and spices, both fresh and dried. When cooking vegetables, think roast, bake, broil or grill. If sautéing stove top, use just a little bit of olive oil. Ready to give it a try? 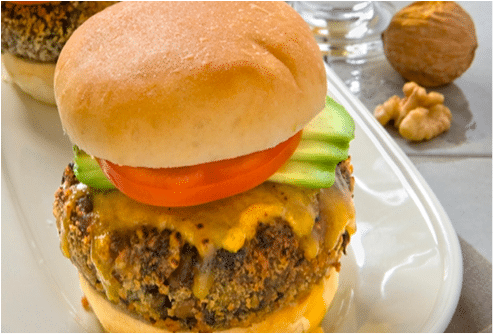 Here is a recipe for Walnut Bean Burgers from the California Walnut Commission. The burgers can be made up to several days in advance and stored in the refrigerator until just before cooking. Uncooked burgers can be individually wrapped and frozen. Defrost before cooking. Place lentils and water in a medium-small saucepan, and bring to a boil. Lower the heat to a simmer, partially cover, and cook for about 30 minutes, or until the lentils are soft and the water is completely absorbed. (Don’t worry about overcooking the lentils. Soft is good in this recipe, and we want all the water gone.) Transfer to a medium-large bowl, add vinegar and mash with a fork or a potato masher. Set aside. Place a medium-sized skillet over medium heat. Add 1 tablespoon olive oil; swirl to coat pan. Add onion and sauté 5 minutes, or until translucent. Add all remaining ingredients except walnuts and bread crumbs. Sauté over medium heat 5 to 10 minutes, or until vegetables are tender. Stir sautéed mixture into lentils along with walnuts and breadcrumbs. Mix thoroughly and cover. Chill at least one hour. Form mixture into 4-inch patties about 1 1/2 inches thick. In hot oiled skillet, fry until heated through, turning once, or broil 5 to 8 minutes on each side until golden and crisp. Top with grated cheese, if desired. Did you know that the Affordable Care Act will require restaurants and similar retail food establishments – including supermarkets that sell prepared foods – to offer nutrition information? The mandatory date for compliance is now December 1, 2016. 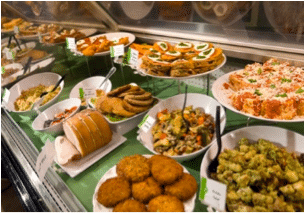 This includes hot buffet food and food from your store’s salad bar, as well as self-service foods intended for individual consumption, sandwiches from the deli counter, pizza by the slice and things like bagels, donuts, muffins and rolls offered for individual sale. In short, any food that is eaten either on premise, while walking away or intended to be eaten shortly after purchase. Establishments are permitted to declare calories either on a printed menu, on signs adjacent to the food, on a sign attached to a sneeze guard or on a single sign or place card. The following statement must also be on all forms of menus or menu boards: Additional nutrition information available upon request. 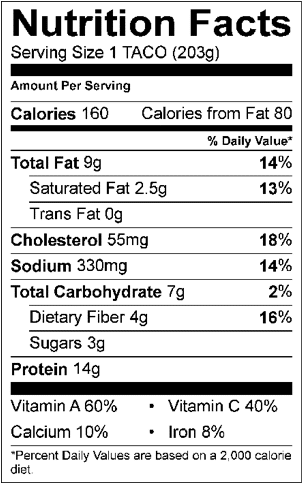 These nutrients must be made available: total calories, calories from fat, total fat, saturated fat, trans fat, cholesterol, sodium, total carbohydrate, fiber, sugars, protein. You must add the following statement to help shoppers understand the context of calories in the daily diet: 2,000 calories a day is used as the basis for general nutrition advice, but calorie needs vary. Very Important! You must maintain documentation of the methodology used to determine nutrient content, as well and the recipe and ingredient information for each item. The FDA can ask your retailer to provide this information at any time in order to demonstrate compliance. Check this blog space in the coming weeks for ideas on how to implement the new federal requirements into your store’s marketing and wellness plans. For more detailed information on specific requirements, review the Vestcom presentation at www.shoppingforhealth.org/conferences/Napa2015. Dietitians know the value of protein to the diet, but do you also recognize the value of protein products to your store? 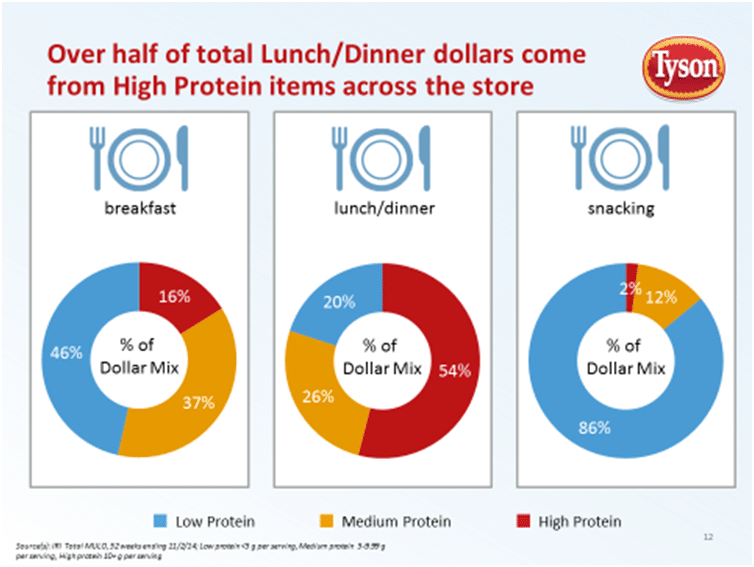 At the 2015 Shopping for Health conference, researchers from Tyson Foods discussed protein as the “perfect pairing” between consumer trends and science. Retail RDs and others have done a good job in communicating to consumers the importance of protein in the diet. Protein is more satiating than carbohydrate or fat; at least 18 grams of protein are recommended to achieve satiety. And consumption of protein consumption plays an important role in promoting muscle protein synthesis in adults and elderly. The optimal rate of muscle protein synthesis is achieved with an intake of 30g of protein per meal, ideally evenly distributed throughout the day. Changing Family Portrait – With single parents, multiple generations living together and people living on their own, American households have a new look. Packaging of food products is one example of responding to the various needs of shoppers. Consumers Always Connected – Technology is a shopping tool for many, as consumers can easily research recipes, ingredients, nutritional information, sales opportunities and more, right from the grocery store. Convenience = Value for many busy consumers. They are willing to pay more for convenience products that reduce meal prep and eating time. Eating for Individual Preferences, Restrictions and Diets – One dish may have to appeal to family members who have differing needs and preferences – gluten free, low fat, no sodium, for example. Seeking Simplicity and Freshness – More and more, shoppers want to know the source of what they eat, and to understand the technology that delivers their foods.